Haggis, Neeps and Tatties: Long Live the Queen and America? Long Live the Queen and America? "In 1939 war against Germany was inevitable, the British Government's Ministry of Information commissioned a series of propaganda posters to be distributed throughout the country at the onset of hostilities. It was feared that in the early months of the war Britain would be subjected to gas attacks, heavy bombing raids and even invasion. The posters were intended to offer the public reassurance in the dark days which lay ahead. The intent of the poster was to convey a message from the King to his people, to assure them that 'all necessary measures to defend the nation were being taken', and to stress an 'attitude of mind' rather than a specific aim. On the eve of a war which Britain was ill-equipped to fight, it was not possible to know what the nation's future aims and objectives would be." So in light of the not so "recent" economic down turn... 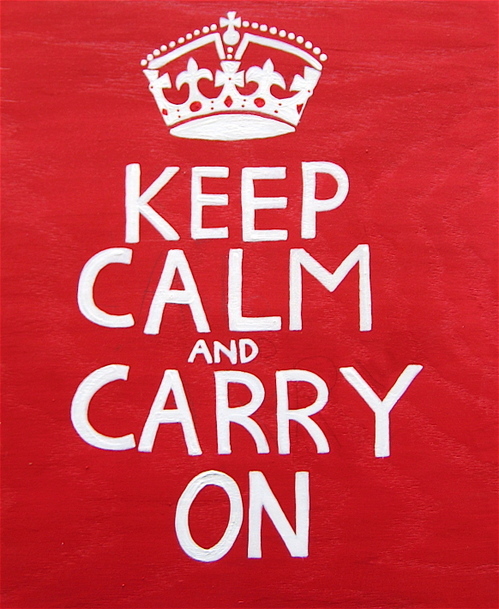 I think we should change our 'attitude of mind' and "Keep Calm and Carry ON. "Print your copy today!!! You too can spread this comforting propaganda.